Remember when I shared with you a list of my beauty essentials, like deodorant, shampoo bars, tooth powder, foundation powder, dry shampoo? Well, I forgot one! 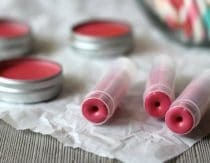 This tried-and-true, super easy lip balm recipe moisturizes and protects with beeswax, natural cocoa butter and your choice of moisturizing oil. While it’s very soothing to chapped lips, it’s also light enough to be worn year-round. If you’d like to whip up a batch to give as thoughtful (yet inexpensive!) gifts, here are the sticky labels I used for this project that you can customize with your “company name.” I go by Potamus & Co., but you can use your last name, a nickname, the name of a place that is meaningful to you (Such as Nashville Co. or Raleigh Co.), or any other word you desire. Tip: Labels tend to peel away easily from lip balm tubes. To help them adhere better, I suggest wrapping a rubber band around the label after application and leaving it on overnight. Once the rubber band is removed the labels should stay put. 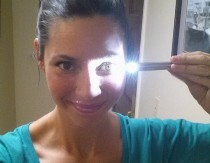 Makes approximately six .15 ounce tubes – the ones I use come in packs of 50 and packs of 100. * Not all essential oils are recommended for lip balm. Certain ones are phototoxic, while others may cause reactions such as irritation or sensitization. 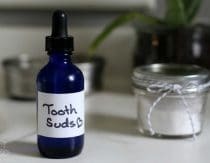 When selecting an essential oil for this recipe, I recommend sticking with ones that are known to be gentle. In a double boiler (or a stainless steel bowl set inside a pot of boiling water), melt cocoa butter and beeswax. Add in the olive/almond, or jojoba oil and stir until thoroughly melted. 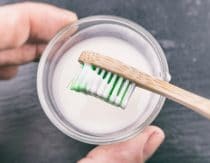 Remove from heat and – if you are using them – stir in essential oils and vitamin E.
One year from the time it is produced. This came at the perfect time. I love giving these handmade gifts away as Christmas presents, so much better to have them made by hand. Great idea for Christmas! I am having trouble with the downloadable template every time I click on it it comes up then disappears. I believe that means it is automatically downloading into your download folder. Maybe check there and let me know? I really like the simplicity of your formulas, ? What does 1 tablespoon plus 1 teaspoon of which oils? can you clarify further THANK YOU! Measure 1 tablespoon and then 1 teaspoon. Good luck! This is Anagha, from India.I made your recipe today with little changes of my own. I added few drops of vanilla fragrance to the recipe. Somewhere in above comments I read that it turned out to be hard, on the other hand with me, it turned out to be softer than expected. I think 2 factors must be considered. Firstly, climate. Here in India, temperatures are nearing 30-35 degrees. Secondly, amount of wax Vs. amount of butter + oil. It will be great help if you can share the measurements in grams. I must admit, Overall results are satisfying. Thanks. Hi, I was wondering if you knew of another brand that sells lip balm tubes, because those ones don’t ship to Canada and are really expensive from Canadian Amazon. I was also wondering if I could use Shea butter instead of cocoa butter. I am from Huntsville Ontario and I use a place called Saffire Blue or Canwax, the first in Southern Ontario, the other in Huntsville. They both sell these tubes and are very economical…. hope this helps. I use Saffire Blue as well and I’m in Edmonton, Alberta. A timely useful recipe for winter and Christmas. I always use olive oil and coconut oil for winter lip care. But it was uneasy for me to carry and use oils with me when I go out of home. You solved my problem now. Hi, I am having trouble with the template. When I go to the link it just shows a bunch of symbols and “gobbledegook” (that is a highly technical term :-)). Is there another link I could try? When I go to the link it just shows a bunch of symbols and “gobbledegook” (that is a highly technical term :-)). Is there another link I could try? This is my first time visiting your website. I can not say in words how much I love it. It’s like I got addicted and I keep on reading all your posts. They are so wonderful. I have an enhancement question to this lipbalm. Can we add some color to this lipbalm like natural color from beets like that! Hi! How could I replace the beewax? I’m vegan, so… Would it make that much difference if I just took the beewax out? Or does it really need to be replaced? Thanks! It’s a necessary component. You could replace it with carnauba wax, but carnauba is harder and so you’d need to play with the ratios. Hi, i am also a vegan and i’ve just made these using plant wax, called candelilla sth, I got it online. Good luck! Instead of using essential oil, can i ise lip balm flavouring (from Aussie Candle Supplies) and just add Stevia Powder (natural sweetening) in these lip balms?? Also i odeered Almond oil instead of Sweet Almond oil, can i still use it in lip balms ?? Hello, I downloaded the template and porchased the labels that you linked to. Not sure how to use these little things in my printer. I have made and love many of your recipes! One quick question: I can’t seem to download your lip balm and other templates. Would it be possible for you to put them up on your site again or email them to me? I love the labels! Very vintage-cool! Hello Heather how many lip balm tubes will this make? Has anyone had any issues with the essential oil in the lip balm eating away at the plastic tube? I have a question. You mentioned that not all oils are recommended for lip balm. Can you elaborate? ?Am actually specially interested in citrus oils. Are they safe for lip balm? I can attest to the photo-sensitivity issue. I regularly use a coconut oil blend as a facial moisturizer and avoided citrus for years because I had heard it could cause vague undefined problems. I made a blend with a tiny little bit of lemon or orange essential oil (very likely a MML big-name brand, that was mostly what we had then) to use as a hair conditioner and right before a trip I ran out of facial blend and used the hair blend on my face… One long car ride later the skin on the lower half of my right cheek was rough with teeny tiny hard bumps! Not visible to the naked eye of others, but it felt like I had paper glued over my skin and wasn’t feeling things right, I kept patting my face for days very weirded out by the strange sensation! It took a while to heal. It felt dead. But the colors I use are colors that are water soluble. How can I add color to oily streaks? 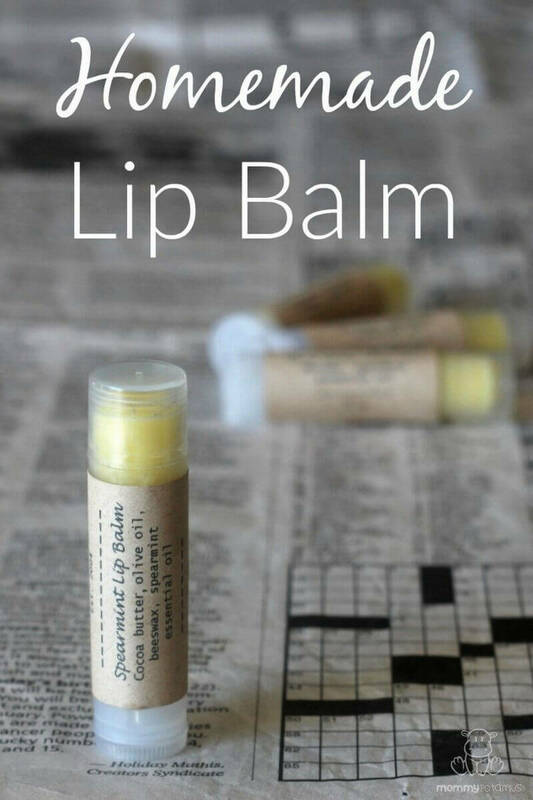 Great lip balm recipe. Was wondering….I like to make lip balms in large batches, do you think if I quadruple the recipe to make about 24 lip balms, would turn out ok? I love the scent of vanilla lip balm and wondered if I could use vanilla essential oil or pure vanilla extract to get that amazing vanilla scent? just to let anyone know that is looking to make lip balm with cacao butter.. fine grating cacao butter is extremely inefficient! it flys everywhere in a weird static driven way, is impossible to pack into a measuring spoon, melts when you touch it when it is finely grated. end up wasting my precious cacao butter. I will now be looking for a recipe for the correct ratios that uses WEIGHT instead, so I can just use my scale to make stuff like this.. typically the way easier and generally less messy more streamlined way to do things. just my opinion. otherwise seems to be correct ratios and probably a great recipe! Hi. Could I use macadamia oil in this recipe? How many tubes of lip balm does this make and how long does it last? How many tubes does this make? I’m thinking about doing this as a classroom project. Thanks! Hi Emily, it approximately six .15 ounce tubes. Hi, I was wondering what do you recommend for a hot temperature location. I find that with most diy recipes my products (lip balms, deodorant) end up melting. They are still usable but not in the desired consistency if traveling in my purse for example. Any thoughts? It would take some experimentation to find the right ratio, but increasing the amount of beeswax used in a recipe would make the final product much less prone to melting. Hello! thanks for this great post, I want to do this recipe but I’d like to avoid the bees wax for environmental purposes. Do you think that soy wax would work as a substitute? or is there any other ingredient that would work? Carnauba wax would be the best substitute but it is harder than beeswax so you’ll probably want to reduce the amount used by a little. 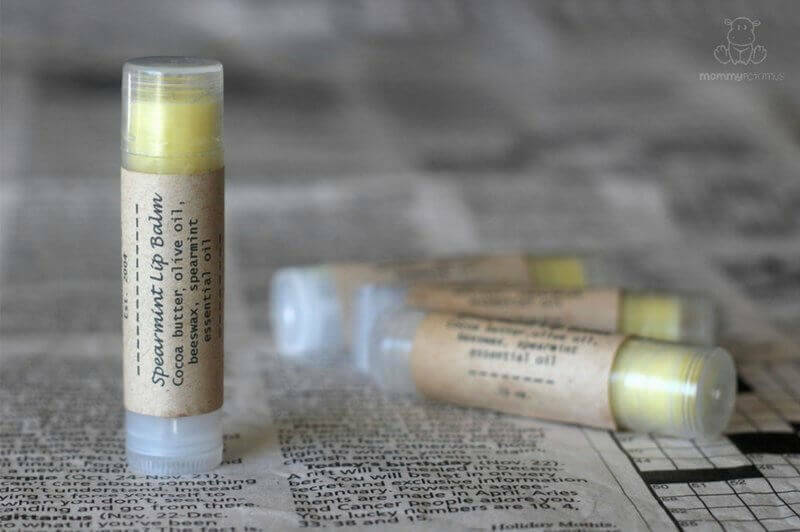 Do you have any recommendations for the scented oil brands/scents to use in the lip balms? I’ve been sticking with Young living and doterra and doing orange and peppermint, but I would like to branch out beyond those two flavors. I just get nervous that some of the other brands/scents might not be safe to use in a lip balm.